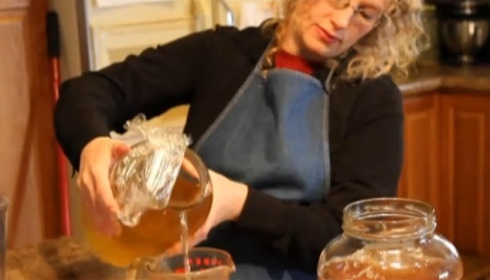 My wife, Wendy, is a master kombucha maker. She brews a gallon per day and our family loves it. And we’re healthy for it! In a glass or enamel large pan (kombucha should not come in contact with metal), pour water. Set to boil. Add sugar. Boil for 5 minutes. Add tea bags and steep for 10 minutes. Remove tea bags with wooden spoon. Let cool. Transfer liquid to a 1-gallon glass container. Add yeast cultures and kombucha tea. It is very important to add starter when the liquid is cold, or the yeast will die. Also, it is important to use glass jars or containers; lead crystal, enamel, plastic and pottery are not suitable for fermenting. Place a napkin on top of jar with rubber band, date it, and place it in dark cupboard for seven days till the day of harvest. On the seventh day, begin your work by removing rings from your fingers. Take the starter organism out of the jar and place it in a glass dish. Pour your kombucha into glass storage container. Keep containers in refrigerator. Drink over ice. It is recommended you drink 4 ounces, three times a day.